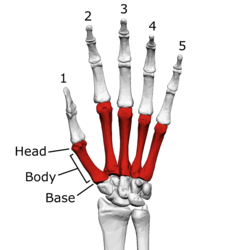 Metacarpals shown in red. Left hand, anterior (palmar) view. The five metacarpal bones, numbered. Left hand, anterior (palmar) view. The metacarpus is the intermediate part of the hand skeleton. It is between the phalanges (bones of the fingers) distally and the carpals which form the connection to the forearm. The metacarpus consists of metacarpal bones. This page was last changed on 28 June 2018, at 12:50.